Celluloid Junkie is proud to have partnered with Vista Entertainment Solutions (VES) for the Cinema of the Month series. Vista is the world’s leading cinema ticketing and software solutions company. We won’t just be featuring cinemas whose operators use Vista, but we will surely mention when that is the case (like this month). CJ would like to thank everyone at Vista for enabling us to showcase some of the most interesting, innovative and inspiring cinemas from around the world. 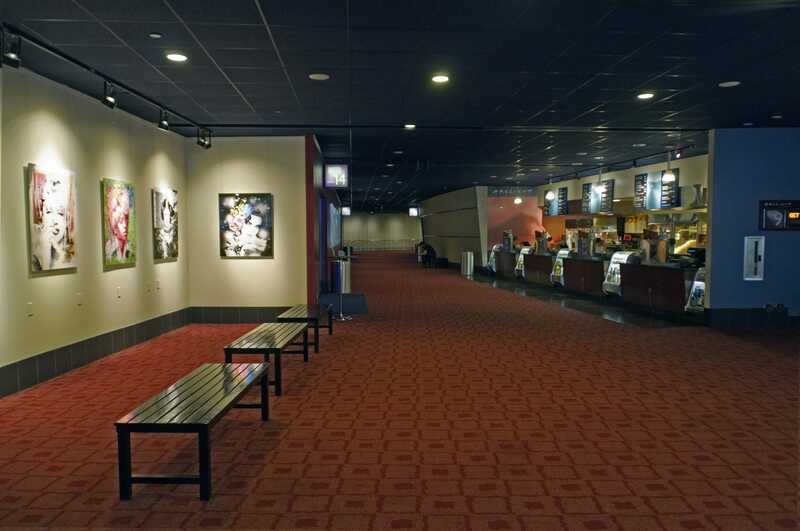 When it was originally suggested we make the ArcLight Hollywood our Cinema of the Month for May it kicked off a debate within Celluloid Junkie’s editorial team over whether the 15-year-old multiplex was truly worthy of being singled out. Did we really need to highlight another cinema located in Southern California, a region already recognized as a mecca of movie theatres? Why not select an older, possibly more historic cinema? Why not a brand new complex? With each round of questioning, the more clear it became the ArcLight Hollywood was a perfect choice for Cinema of the Month. Not because it is home to the historic Cinerama Dome, nor because its proximity to Hollywood studios makes it a prime choice for countless movie premieres and certainly not because the theatre boasts any cutting edge amenities. 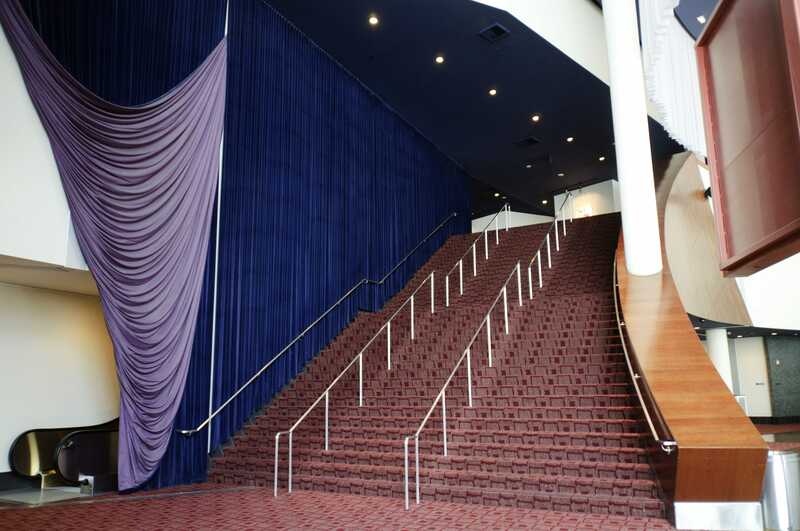 In fact, it is the very banality of its current features that is really the whole point; the ArcLight Hollywood isn’t notable for what it is today per se, but rather what it did to pioneer what is now commonplace in many modern cinemas. Reserved seating, lobby gift shops, full-service cafes and bars are just a few of the amenities ArcLight Hollywood helped popularize. To be sure, when ArcLight first opened in March of 2002, they weren’t the only cinema operator experimenting with such VIP offerings. 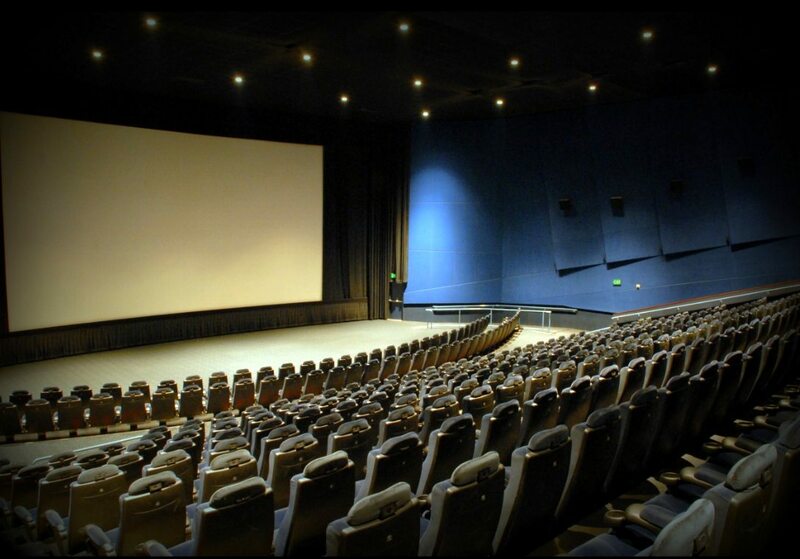 Yet over the years many of its luxury cinema competitors exited the business, and others, such as Cinépolis USA and iPic, launched similar concepts. Meanwhile, ArcLight Cinemas continued to grow nationally into a circuit with 139 screens across 10 theatres in three states, of which ArcLight Hollywood is now the flagship location. In a way, the importance of the ArcLight Hollywood has always been defined not by the present day, but by history. 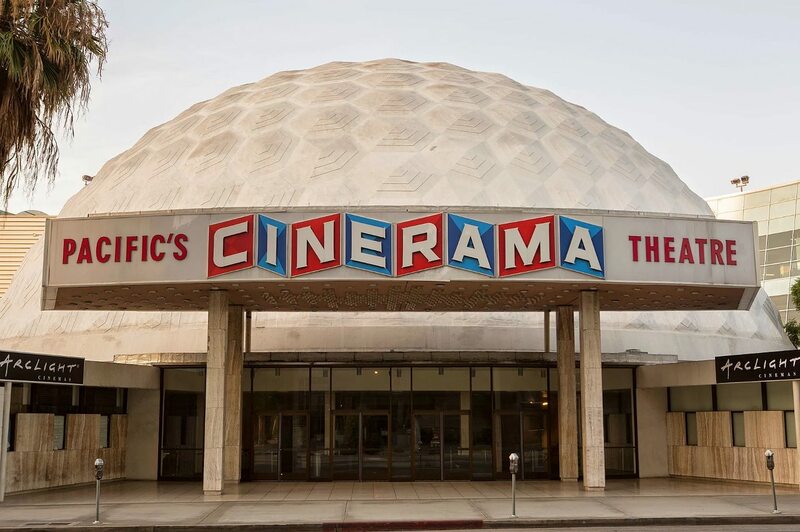 The 14-screen multiplex was opened by Pacific Theatres as part of a $100 million retail complex built in what was then the parking lot of the chain’s legendary Cinerama Dome on Sunset Boulevard near Vine Street. Arguably one of the world’s most recognizable cinemas, the Dome (as it is commonly referred) made its debut in November of 1963. The geodesic dome which makes up its roof is based on a design created by R. Buckminster Fuller and is comprised of of 316 cast-concrete hexagons. It is considered a classic example of the period’s Googie style architecture. Indeed, we used it as such when redesigning Celluloid Junkie into its current form which heavily references the mid-century aesthetic – compare the alternating red-blue lettering in the Cinerama name and our CJ initials. With cinema owners fearing the widespread adoption of television would mean the end of movie theatres, Pacific originally built the theatre to show films on an ultra-widescreen. 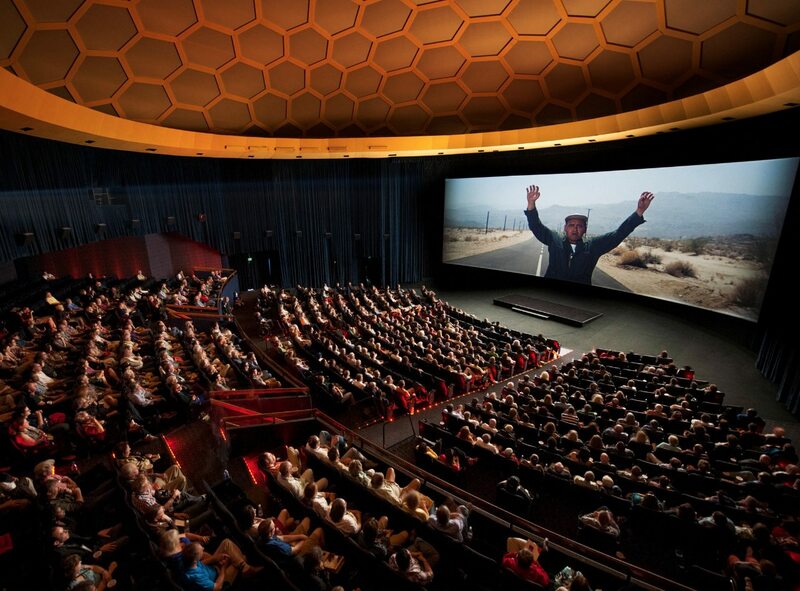 Unlike other theatres equipped to to show the three-strip Cinerama format, the Dome only ever ran films using Cinerama’s single lens technique. 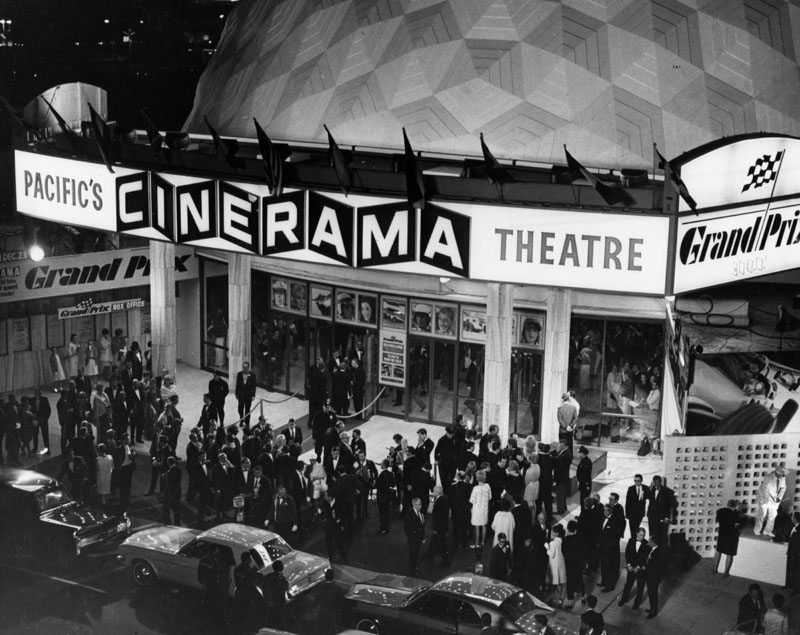 And while it was meant to be the first of hundreds of theatres built to show movies in the format, the Cinerama Dome is the only example to ever utilize the design. That is why controversy erupted in the late 1990’s when Pacific announced plans to gut the interior of the Dome as part of a new multiplex and commercial development. Appeals were made to the Los Angeles Cultural Heritage Commission to give the theatre landmark status, and on December 18, 1998 the exterior of the building became the city’s 659th Historic-Cultural Monument. Today, the screen inside the Dome is still 86 feet wide, however the seat count has been reduced from the original 937 to just over 800. The theatre uses two Christie Mirage 4K projectors and features Dolby 3D and Dolby Atmos. In addition, it has Kinoton projectors with DTS 6-channel and 6-track magnetic sound allowing for both 35mm and 70mm films to be screened. 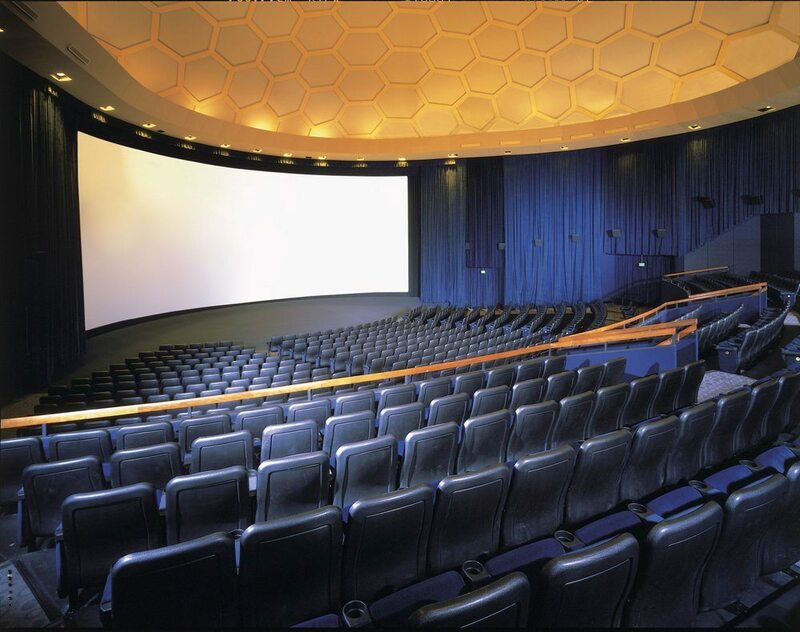 Ironically, after the two-year renovation leading up to the opening of the ArcLight Hollywood, the Dome is capable of playing three-strip Cinerama with 7-channel Cinerama Stereophonic sound. When Pacific Theatres cut the ribbon on the ArcLight Hollywood in 2002 the theatre was an instant sensation. It became one of the cornerstones for the revival of classic Hollywood which took place during the early aughts. What was once a storied part of Los Angeles had fallen on hard times beginning in the late 1970’s and by the turn of the millennium Hollywood had become an economic wasteland that even tourists were growing leery of visiting. However, in 1996 the city established the Hollywood a Business Improvement District and eventually began funneling money to developers willing to build in the area. The ArcLight retail complex was one of many developments that sprung up. The Hollywood & Vine complex, where the Dolby Theatre hosts the annual Oscars ceremony, was another. From the start, the ArcLight was a hit with studios who began holding premieres and special screenings at the venue (and still do so today). The cinema was one of the first in Los Angeles (if not the first) to have a cafe with an extensive menu and fully stocked bar, which was a bonus for time strapped industry professionals. The ArcLight quickly became one of the most popular cinemas in Los Angeles. At the time, patrons only seemed to have one complaint; the USD $14 ticket price was much higher than anywhere else in town. Besides a cafe and bar, a corner of the ArcLight’s huge lobby was set aside as a gift shop of sorts. Before or after a movie, you could mill about this area browsing through related books, specialty magazines and knick knacks. Though the merchandise effort wasn’t necessarily an afterthought, it always felt as if it were meant for window shopping or impulse purchases. Maybe that’s why the retail space within ArcLight has since been reduced to make way for a gourmet coffee bar. Pacific hoped that all of these efforts would help extend the moviegoing experience at ArcLight beyond the actual screening. They wanted audiences to arrive early and mingle after a showing in an upscale setting. Thus the revolving art exhibits which continue to line its hallways. Of course, for the main attraction, ArcLight aimed to provide the best theatrical movie viewing experience on offer. Each of the 14 black-box auditoriums were THX certified, equipped with digital surround sound and outfitted with extra-wide stadium seating. 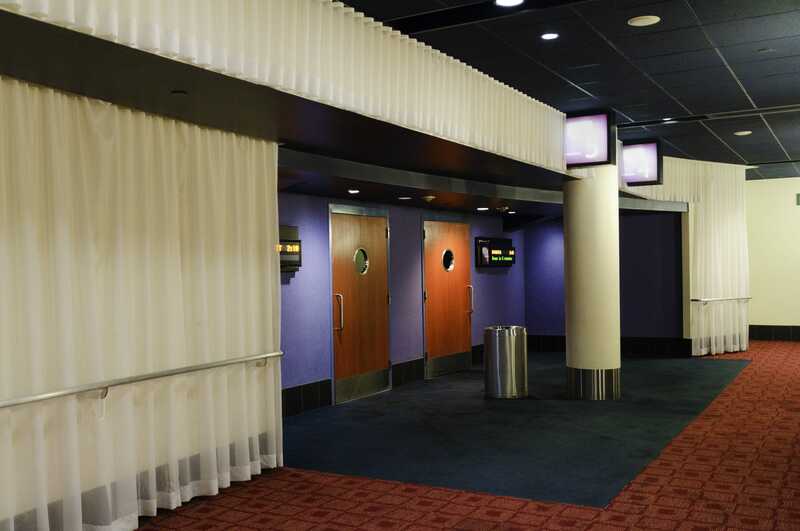 ArcLight designed each of its auditoriums to reduce distractions from whatever film was being shown. To that end the ArcLight did not have any preshow ads, beyond trailers for upcoming movies, and would not allow late seating. In a city populated by some of the most discerning and serious moviegoers, the ArcLight was a tiny piece of heaven, a cinema where they could go to watch both blockbuster and arthouse titles presented exactly as their creators had intended. For many Angelenos, once the theatre opened, if they couldn’t see a new release at the ArcLight, then it wasn’t worth seeing. This made another of the ArcLight’s benefits almost mandatory; reserved seating. Not only because it allowed finicky cinephiles to see where a seat was in relation to the screen, but more so because customers could ensure their preferred seats were available before driving across town, (which could take hours in Los Angeles), only to discover the only open seats were in the front row. With internet adoption was on the rise, web ticketing was becoming more of a factor. Thanks to a system from Vista Entertainment Solutions the ArcLight was one of the first North American cinemas to support reserved seating. Many leading circuits have since followed their lead. Given the past tense in which we’ve thus far written about ArcLight Hollywood, one might be inclined to believe the cinema has fallen on hard times. Nothing could be further from the truth. It’s just that the ArcLight was so far ahead of its time, it hasn’t had to change much of its winning formula over the years as other exhibitors caught up and in certain instances began their own trends. For instance, the ArcLight was ahead of the curve on installing cushy rockers, an amenity which may seem outdated in an age when leather recliners have become standard cinema furnishings. On our recent visit we saw the multiplex hadn’t changed much over the past 15 years. The high-ceilinged lobby still gives off the kind of mid-century modern vibe that fits well with the landmark Cinerama Dome. The same giant curved marquee hangs high above a ticket desk that resembles a hotel registration or airline ticket counter. (Despite the sign hanging outside the lobby, you won’t find a box office at the ArcLight.) Orange LEDs light up the marquee with those titles currently playing and their associated showtimes. At its center is a large analog clock displays the time. The marquee is notoriously difficult to photograph without slow shutter speeds due to the refresh rate of its LEDs, but is always beautiful when viewed in person. The ArcLight lobby almost always has costumes, props or special artwork on view from one of the movies it’s showing. Costumes from the upcoming “Wonder Woman” movie were on display during our visit. When the Warner Bros. movie opens in early June, one of its showtimes at the ArcLight will be in 70mm. One noticeable difference from the theatre’s early years, is that the self-service touch screen ticketing kiosks located outside the cinema, so innovative in their day, have been upgraded and moved just inside the entrance. At the far end of the lobby, opposite the entrance and closest to the actual auditoriums, a staircase arcs up to a second floor where a balcony which overlooks the entire lobby, including the cafe. 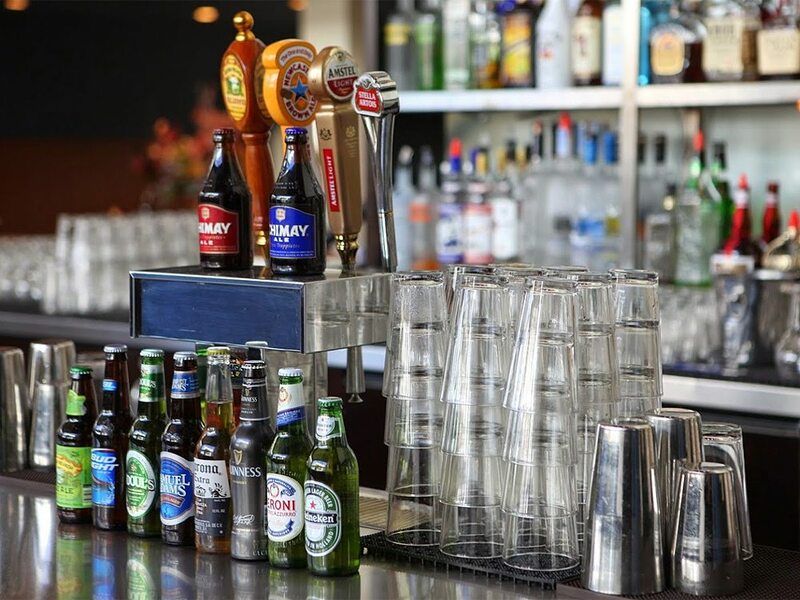 Here a smaller bar awaits, used primarily for special events and parties that are often held in conjunction with the many film festivals that book out the ArcLight during the year. Outdoor seating is available on patios adjacent to both the balcony bar and the ground floor cafe. The ArcLight’s auditoriums are reached by escalators; screens 1 through 7 a floor below the lobby and screens 8 through 14 stacked above on the second floor. The lay out of auditoriums on both floors is identical. This puts the 400+ seat screen 10 directly above a similarly sized screen 3. 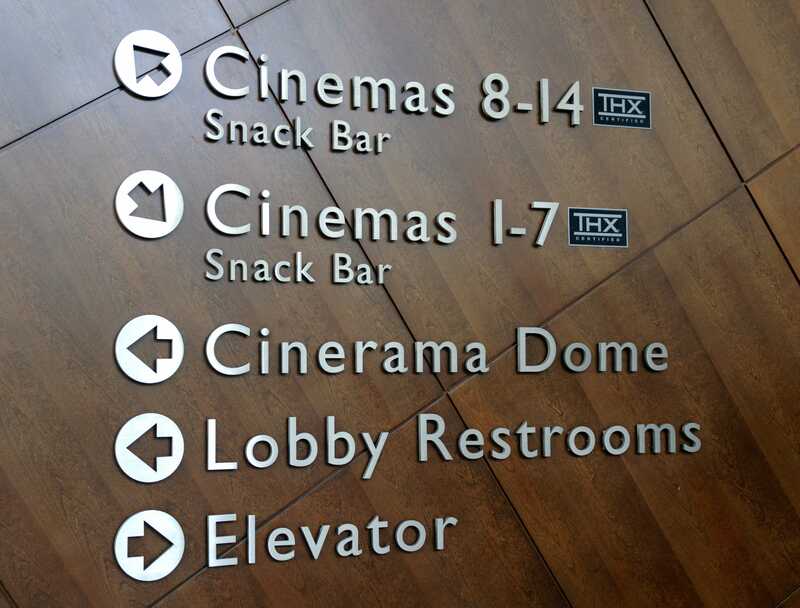 The twinning of the multiplex’s two levels includes the placement of the concession stands, or as they are known at the ArcLight, the snack bars. 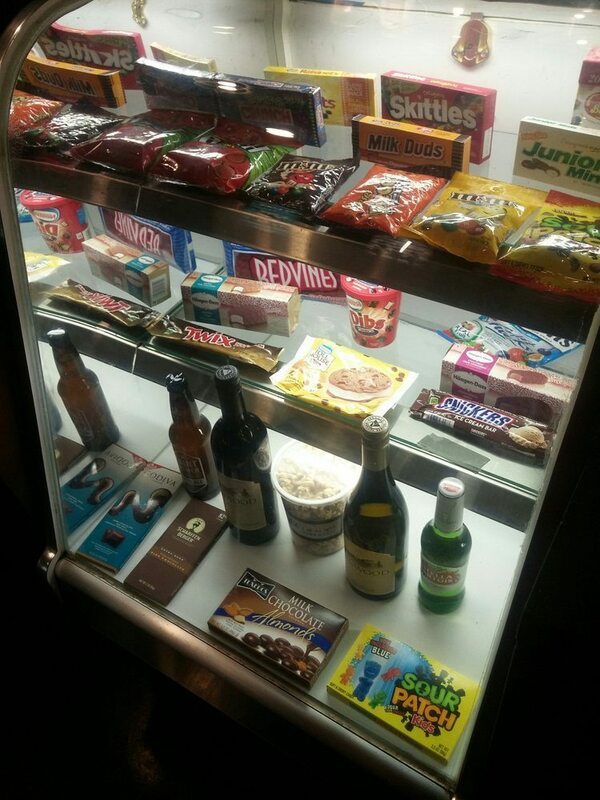 The usual cinema fare can be had at both, including popcorn, soft drinks, hot dogs and candy. But there is also coffee, a sausage baguette, wine and beer on offer. 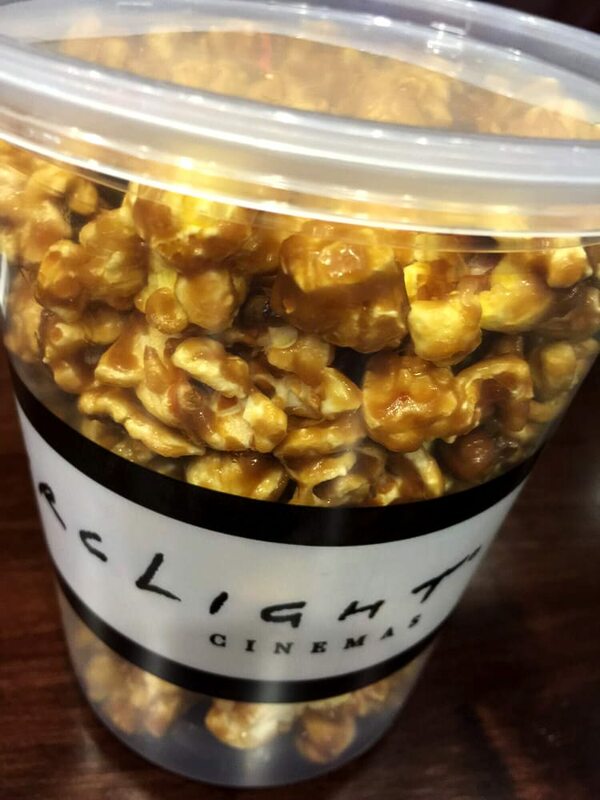 However, if you really want the full ArcLight experience, you’ll want to opt for a tub of the theatre’s special caramel popcorn (USD $7.25), made fresh daily onsite and served while it’s still warm. Candace Nelson, the founder of Sprinkles Cupcakes, once hailed it as the best crunchy food she’s ever tasted. The regularly popcorn (starting at USD $6) is no slouch either and is served with real butter if you so desire. Both are served in tubs rather than paper bags to cut down on all the rustling noise that comes from reaching for that very last kernel. If pressed, we’d admit to ordering both versions in the name of professional research during our trip to see “Guardians of the Galaxy Vol. 2”. By late May the title had been moved to a smaller house, however the presentation didn’t suffer from this. 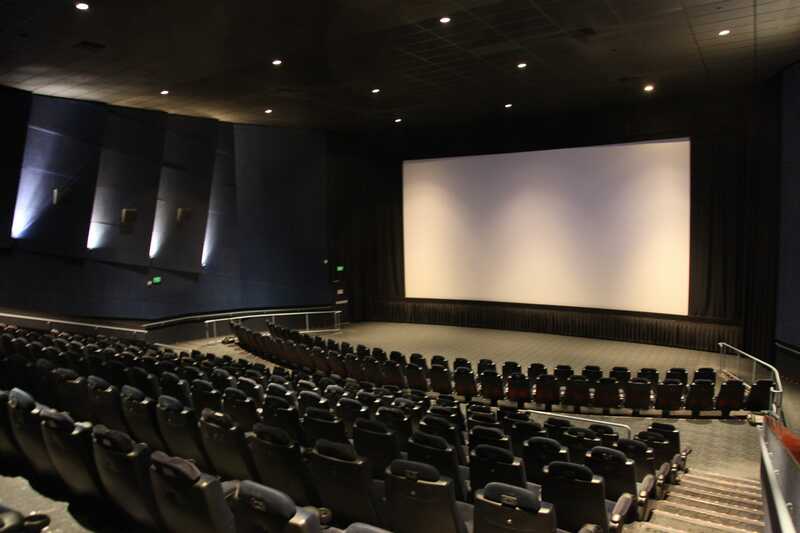 The ArcLight converted its screens to digital projection back in 2008, which came with the added benefit of piping uncompressed digital surround sound into each auditorium. Entering the theatre for our screening, we were reminded that each row and rocker were clearly labeled. Though a rarity when the Arclight first began welcoming visitors, it was an absolute necessity for implementing reserved seating. Just before the lights dimmed from their baseline state of dim illumination, we were treated to another Arclight trademark; the introduction of the feature film. 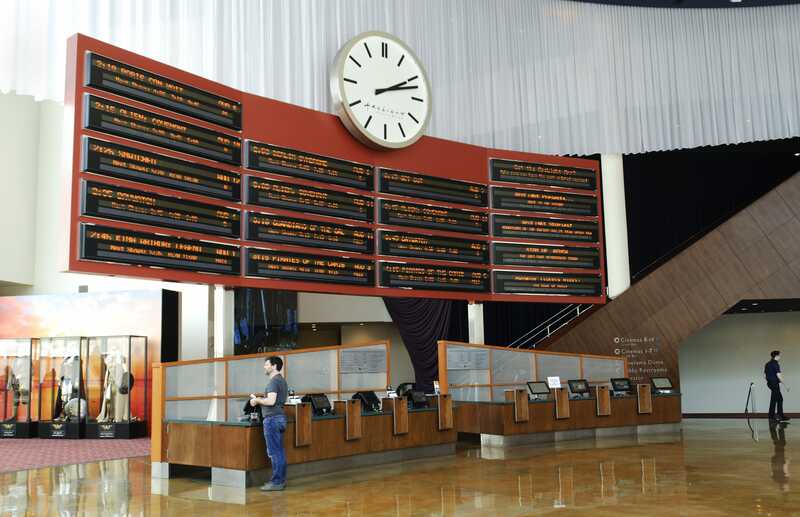 Before each showing of a movie at ArcLight, dating back to its first day in operation, a staff member stands at the front of the room and provides the audience with the title of the film, its running time, director, cast, rating and any other relevant information. As a quality assurance measure, they then wait near the entrance of the auditorium for the movie to begin, before silently slipping out. Employing personnel to deliver such an experience has always meant the Arclight’s operating costs were higher than those of traditional multiplexes. That was the reason given for the higher ticket prices in 2002. Naturally the cost of admission has kept pace with inflation and adult prices are now USD $17.75 Friday through Sunday and USD $15.75 on weekdays. A 3D showing has a USD $3 premium and matinees do not have a reduced price. This price level is higher than most traditional multiplexes in Los Angeles by a couple dollars, though not nearly as costly VIP cinemas like Cinépolis or iPic. When ArcLight Hollywood first lit up its marquee, few theatres in the country offered a restaurant or cafe with a complete menu. Back then, Alamo Drafthouse, the exhibitor everyone associates with sparking the in-theatre dining craze, was just five years old and had only two locations. 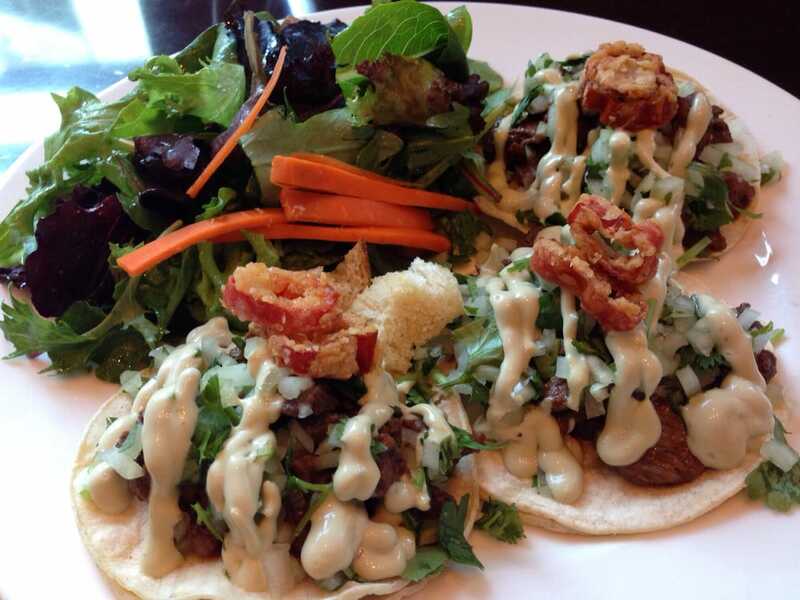 The food at ArcLight was considered above average; good not great. But it was a far cry better than what you could find in the surrounding Hollywood neighborhood and was ideal for grabbing a quick dinner before an evening press screening, even if the food felt slightly overpriced. As time marched on, Hollywood became a hip, happening place with dozens of hot, new trendy restaurants duking it out for diners. Even the ArcLight complex now has three restaurants including chain locations for Veggie Grill and Blue C Sushi, as well as Stella Barra, an incredibly popular artisanal pizzeria. 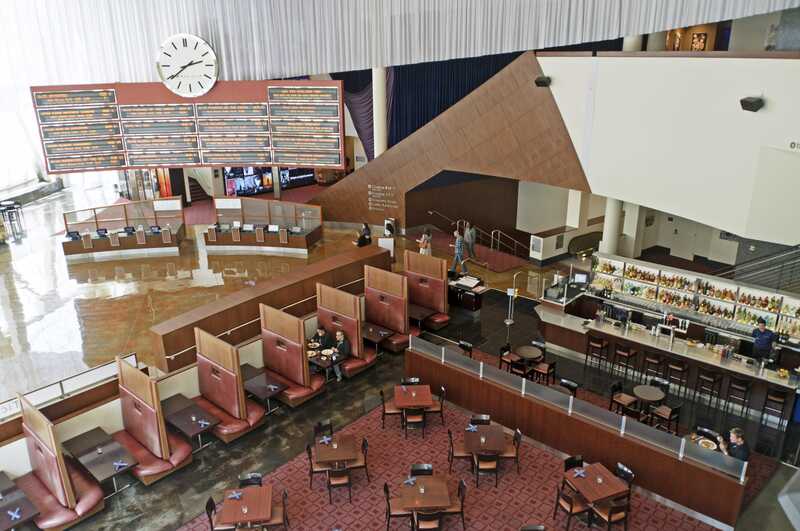 It was widely predicted that the ArcLight Hollywood Cafe and Bar wouldn’t last even before the Los Angeles culinary world set up shop on its doorstep. That it has, is a testament to the support a cinema can provide for a dining establishment, and vice versa. 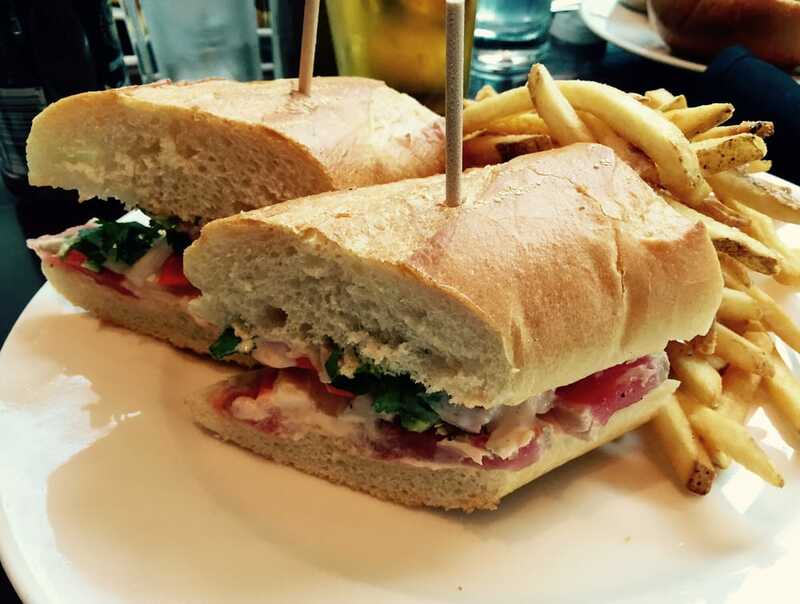 The current menu serves up appetizers such as a charcuterie platter (USD $16), main courses like fish and chips (USD $16), fish tacos (USD $15) and kobe beef bolognese (USD $17), as well as sandwiches that range from a classic cheeseburger (USD $15) to a spicy ahi tuna banh mi (USD $17). I was always partial to the corned beef reuben panini (USD $16) and can safely report it has withstood the test of time. 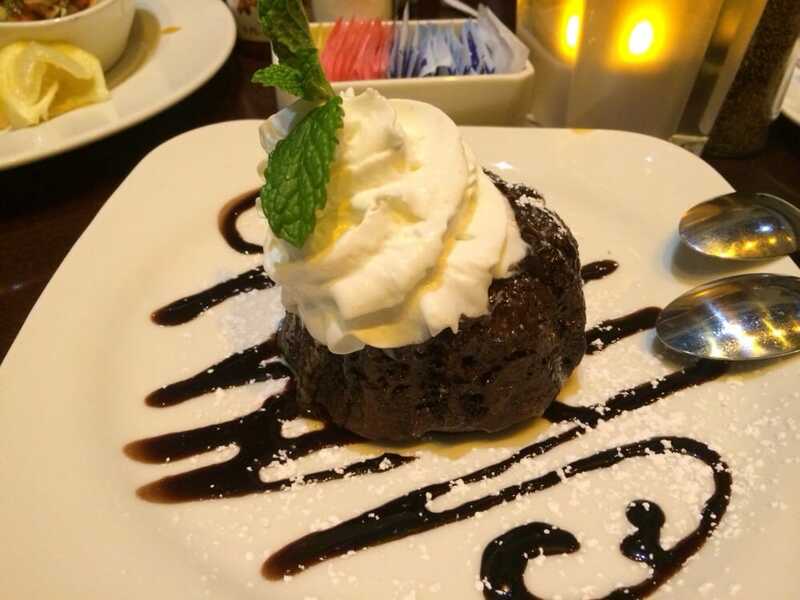 Desserts range from classic apple pie to a s’mores lava cake or brownie and vanilla ice cream (all of USD $9). 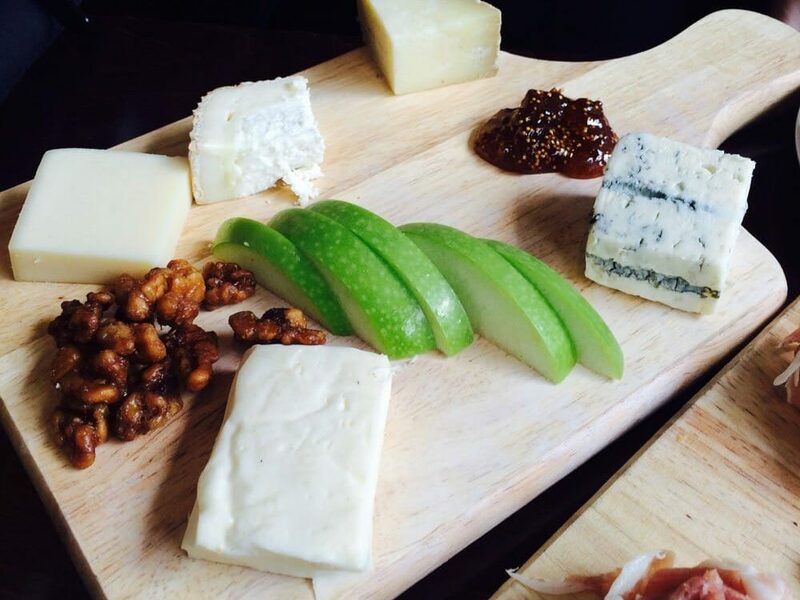 When compared to a chef driven cinema dining concept like what Sherry Yard oversees at the iPic venues in Westwood and Pasadena, the ArcLight Hollywood Cafe can hardly compete. It’s hard to imagine anyone showing up for lunch or dinner without a movie ticket in their hand (or more appropriately these days, on their phone). That may be why when we stopped in on a weekday, the cafe was empty. But then, so were most of the screenings. 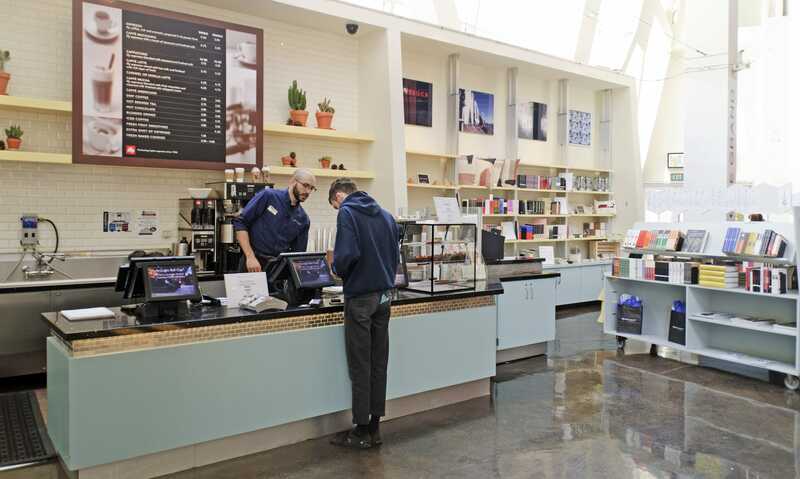 Surely, beyond the regular showings of the latest blockbusters and limited arthouse releases, what keeps the ArcLight’s cafe in business are all the special screenings, festivals and events, all of which can be catered in-house. ArcLight Hollywood wasn’t the first cinema to offer a loyalty program, nor was it the first to start charging patrons to join. In that regard they followed AMC, which in 2011 began charging USD $12 for its Stubs program. In October 2013 ArcLight Cinemas (which by then had locations in El Segundo, La Jolla, Pasadena, Sherman Oaks and elsewhere) began charging USD $15 for membership to their own loyalty plan. 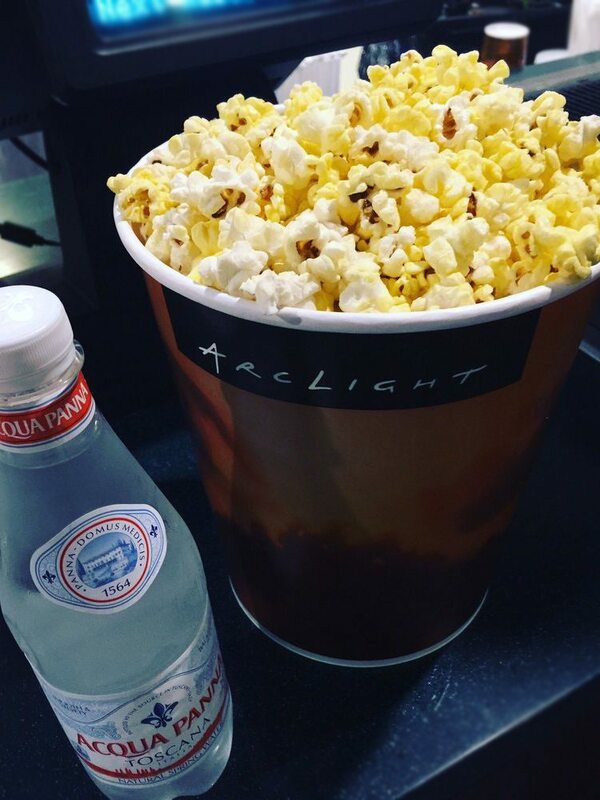 ArcLight membership comes with the usual set of benefits like the waving of online ticket fees, concession upgrades, reduced cafe prices, a free ticket on your birthday and the accumulation of points towards free admissions and refreshments. The most unique perk is receiving two free tickets each year for one of the ArcLight Presents screenings. The series is a curated program of classic films, restorations and exclusive releases, most of which include appearances by the filmmakers and cast of the movie being shown. Because of its Hollywood setting, the ArcLight has plenty of access to such talent and holds these events, if not every week, then definitely every month. In a city filled with movie aficionados and film industry stalwarts, it is not uncommon to spot a well-known actor or director milling about the lobby or hallways of the ArcLight Hollywood. Even after 15 years, and despite all the “me too” venues that have sprung up throughout the city, it is still considered one the premiere movie theatres in Los Angeles. And though the facility is beginning to show the scuffs and scrapes that any multiplex is bound to pick up over time, the ArcLight Hollywood wears it well, having begun its life by proving that sometimes a cinema with a bit of history shouldn’t be overlooked simply because of its age. Celluloid Junkie selects the CJ Cinema of the Month based on our own independent survey. We always pay for our own tickets and the freshly made and served warm caramel popcorn, and visit the cinema in a ‘mystery patron’ capacity in most cases. Whenever possible we take our own photographs of a cinema in lieu of corporate stock photos. Thus, sometimes you get authenticity at the expense of focus. Our impressions may be subjective, but we always try to be fair and factually accurate in everything being presented about one of the cinemas we have chosen.